An award-winning AWS Serverless Appliction that produces filtered Socrata datasets. NOT affiliated with or endorsed by Socrata. Hundreds of local, state and federal government organizations use Socrata to host open data portals to share data sets with the public. The public can interact with these datasets in various ways, but these ways may not be intuitive for the general public. And people who understand how to manipulate these datasets don't want to repeat the same manual tasks every day, week or month. nephridium addresses the use case where a dynamically filtered Socrata dataset is desired over time. You specify the Socrata dataset, tell nephridium what the date attribute is and you get an HTML table of the data! nephridium offers additional parameters you can use to choose which attributes you want to display and to further filter your dataset. 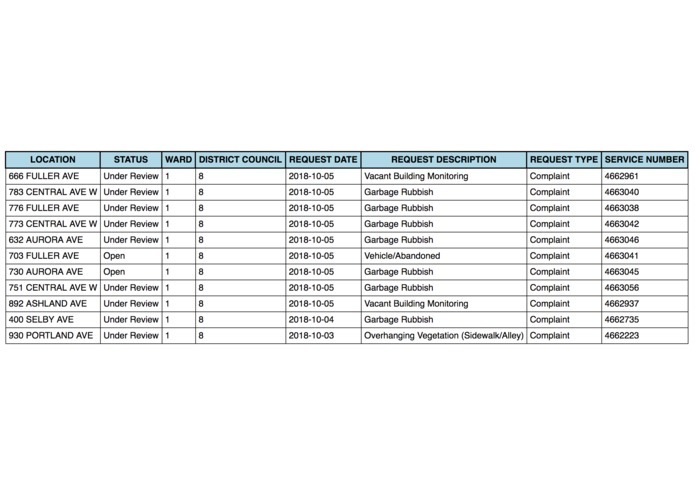 A Saint Paul District Council Executive Director wants to know all of the resident service requests that created in her district the past week. And she wants this information every week. Saint Paul provides the data, but only in a way where the Executive Director has to enter filter information every single time she visits the site. Since nephridium uses a look-back date filter, one URL will work in perpetuity. For example, https://your_aws_url/?district_council=8&time_column=request_date&url=https://information.stpaul.gov/resource/qtkm-psvs will produce the previous 7 days' results for service requests in District 8. Once an URL is created it can be used with IFTTT, Zapier, cron or any other automation tool to automatically send an email with the requested data. Nephridium is like a kidney for an invertabrate. It filters things, just like this code. DATASET_URL: A Socrata dataset. See https://www.opendatanetwork.com/search?q=service+requests if you need one to try out. You can also search for you city/state/county, like https://www.opendatanetwork.com/search?q=kalamazoo. Note that the dataset URL is specific -- https://dev.socrata.com/foundry/data.michigan.gov/kkup-j7i5 is an example. The page should have the text About this dataset on it and maybe some example URLs. TIME_COLUMN: A floating_timestamp value for your dataset. This is the value that's used to get the last week or month of entries. If you scroll down on the dataset page to the Fields section there should be at least one floating_timestamp. On https://dev.socrata.com/foundry/data.michigan.gov/kkup-j7i5 deadline_date is the value. Whew! Now that you have the ingredients it's time to craft the URL you'll be using. Make sure DATASET_URL is last! If we want to further filter the dataset we can do that, too. In our example, let's say we don't want to see the county column. We'll add a to_remove parameter for that. And if we want to remove more than one column, we just separate them with a comma (no spaces!). Let's also remove the column that shows whether there's a GPA requirement. Let's retrieve only records where you don't have to have graduated to be eligible. We do this by specifying the column name (grad_y_n) and a value in the URL. You can modify nephridium to return JSON instead of HTML, internallly filter your dataset(s) to minimize the number of parameters in your users' URLs, format the output (e.g., custom CSS), or restrict who can access the API. If the previous command ran successfully you should now be able to hit the following local endpoint to invoke your function. Note that CloudFront (but not your local api) returns a 403 when it receives a GET with a body, so you must use query parameters instead. SAM CLI is used to emulate both Lambda and API Gateway locally and uses our template.yaml. Next, the following command will create a Cloudformation Stack and deploy your SAM resources. I've only been able to do this using an IAM user with full administrator rights. My first AWS serverless application deployment -- it was much more complicated than building a Lambda-based Alexa skill. I learned a lot about the AWS infrastructure and permissions management.